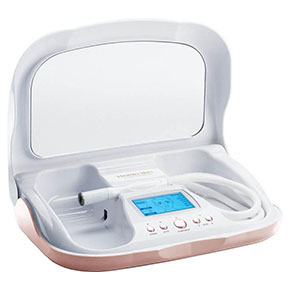 The Best At Home Microdermabrasion Machines (With Video Reviews!) – Microdermabrasion is the gold standard in maintaining flawless and youthful skin. It is a premium skin resurfacing and rejuvenating treatment that removes the upper layer of dead skin, as well as deep-seated oil and dirt. Through aging and other environmental factors, the process of skin renewal is disrupted. This causes delay and improper shedding of dead skin, which ultimately leads to dull and aged complexions. The way microdermabrasion works is based on the principles of wound healing whereby removing the superficial layer of the skin promote cell renewal and generate a healthier epidermis. Previously, microdermabrasion machines are large, bulky machines that are very expensive. The technology has now evolved to portable devices, making it easy for anyone to make it a regular part of your skincare regimen. What used to be an expensive clinical procedure that could only be done by skincare professionals, is now readily available for home use. 1.7.1 How Does Microdermabasion Work? 1.7.2 What are the Benefits of Microdermabrasion? 1.7.4 What Skin Problems Can Microdermabrasion Address? We’ve chosen the best at-home microdermabrasion machines based on technical specifications, quality, value for money, and consumer reviews. Silk n’Revit comes highly recommended by those with oily and acne-prone skin as the product still manages to pick up grime even after using deep cleansers like Clarisonic. Users (like myself) have experienced a reduction in pimples and acne after using this regularly. This can be used up to two times a week without any discomfort. Those with severe acne scars that have used this for several months have seen improvements, though the scars are still visible. 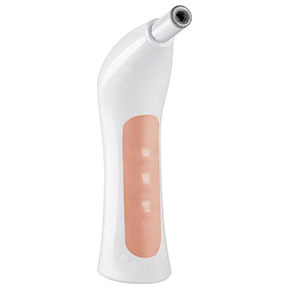 Blackheads are no longer an issue as well, as the device picks it up along with the sloughed off skin. Some of the cons are the device’s durability. I feel like the tip should fit more snugly, although it does glide smoothly. There also isn’t that much difference between the two tips, especially after doing it for some time. For the price though, the device is very cost-effective. Usual systems have two diamond tips–coarse for all over the face and precision for corners like the nose and sensitive areas around the eyes. This unit has 3 diamond tips, the final being the fine tip for your neck. Another great thing is it runs on AAA batteries so you don’t have to deal with an extra cord in your bathroom, especially if you’re traveling and on the go. Ironically, the con is also that–battery life. You can burn through a load of AAAs if you use this several times a week. If you’re not a frequent traveler, I’d recommend passing on this one and opt the corded ones like Silk’n Revit (shown above) or MiniMD (shown below) instead. At-Home Microdermabasion Systems from Trophy. Choose whichever fits your skincare needs: MiniMD for sensitive skin and general maintenance, RejuvadermMD for those with normal to combination skin and moderate skin issues, and MicrodermMD for looking to treat skin problems like hyperpigmentation, acne scars, fine lines, etc. The entire session as per advised takes only about 7 minutes, including prep and applying serums after, so the process is quick and easy especially for beginners. It’s not as aggressive as other machines as well so this is perfect for those with sensitive skin or for skin maintenance. One of the cons is that unit is light (more so than a Clarisonic or a Sonicare toothbrush) so it feels like it will crack easily. There is a warning on the manual though not to drop the device as it may damage the machine. There is also the faint smell of something burning near the end of the process which I’m assuming is caused by the speed in which the dead skin is being collected in the filter. It doesn’t bother me as much but still something to note. This is a professional grade and close to salon-quality machine at your home. It has an LED display that will walk you through the process to make sure you attend to each area just right. The device also has an AUTO MODE that automatically adjusts the suction and timer properly across your skin. 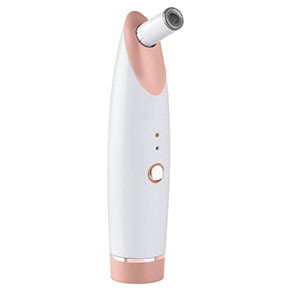 The set comes with a blackhead extractor (nifty), 100 filters, and a 5x zoom-in mirror built in so no more leaning into the mirror whilst doing the treatment. The con is, of course, it’s size. You can’t exactly lug it around as with the handheld versions. It’s also quite an investment compared to the others, but it quickly paid for itself after a few weeks (especially since a single session at a salon costs $100+). If you’re doing microdermabrasion as part of a long-term solution for skin problems like hyperpigmentation (sun spots, acne scars, etc. ), I would definitely go with this one. Ideal for: All skin types, those with long-term skin issues like hyperpigmentation (acne spots), acne scars, photodamaged skin, etc. Video: Trophy Skin Microderm MD Review: Are the Claims True or Farce? RejuvadermMD is the middle child between the professional grade MicrodermMD (shown above) and the MiniMD. It’s easy to use, has more available settings than the MiniMD and costs less than the Microderm MD. I’d say it has equal power as the Silk’n Revit. The equipment is a basically a closed vacuum that draws the skin to a diamond-tipped pad that abrades the skin’s surface. The surface debris or dead skin is collected in the device for disposal after the treatment. The depth or the strength of skin resurfacing is comparable to that of a chemical peel but without the downtime. If you have post-inflammatory scarring from acne or have sun spots, an at-home microdermabasion system is one of the best products for hyperpigmentation you can buy. If you’re trying to solve this problem, make sure you also have an effective treatment plan in place. We’ve laid out the same steps aesthetician’s use in their clinics to treat hyperpigmentation in a previous post, so make sure to check that out as well (see below link). What Skin Problems Can Microdermabrasion Address? Microdermabrasion treatments rarely have downtimes. If you have extra sensitive skin though, these symptoms may appear but usually subside after a few hours. If you have sensitive skin, your skin may feel pink and sensitive after. If not, but it so happens that you were a bit enthusiastic and went in for a setting above what your skin is used to, you can apply a cold compress to ease any discomfort. Initially, do the treatment in wide intervals. Maybe once or twice a week until you feel comfortable in using the produce on a more regular basis. You can perform your regular skin regimen right after. If you have sensitive skin, apply your topical products only after the redness has faded. Try to avoid direct sunlight a few hours after treatment. That’s fresh new skin, you don’t want to expose it to damage so soon! A Practical Guide to Chemical Peels, Microdermabrasion & Topical Products. (n.d.). LWW; 1 Har/Psc edition. Emedicine.medscape.com. (2016). Seborrheic Keratosis Clinical Presentation: History, Physical, Causes. Firstskinfoundation.org. (2016). Living with Ichthyosis | Foundation for Ichthyosis & Related Skin Types (FIRST). Living with Ichthyosis | Foundation for Ichthyosis & Related Skin Types (FIRST). (2018). My.clevelandclinic.org. (2016). An Overview of Your Skin. Personal Microdermabrasion & Home Microderm Kits – Safe, Proven, Easy. (2018). Seborrheic Keratosis Clinical Presentation: History, Physical Examination, Complications. (2018). Silk’n – Hair Removal, Anti-Aging, Acne & More!. (2018). The Effects of Microdermabrasion on Skin Remodeling – Full Text View – ClinicalTrials.gov. (2018). WebMD. (2016). Your Skin: Are You Doing Too Much or Too Little?.